Don’t miss this fabulous Grayson Perry inspired Student Makers Market taking place at Turner Contemporary on Saturday 8th August 2015 from 10am to 6pm. A huge array of work a from many talented young designers will be on sale at this one off seaside market, from fine art to clothing, jewellery to screen prints and upcycled vintage outfits to childrens toys. The market will take place in the beautiful sea facing Foyle Rooms alongside Grayson Perry’s Provincial Punk exhibition. Watch our Facebook page for the latest information and the list of makers taking part. If you’re an east Kent maker and would like to get involved contact us for more information. This FREE exhibition and themed market will be a huge treat for all Grayson Perry fans! ‘YOUth’ his new collection of menswear. Visitors to many of our markets will know Robert for his unique approach to market trading and iconic one off stalls. Roberts Interactive Fashion Shows will take place in the Learning Studio at 2pm and again at 4pm. Everyone is welcome! For more information or if you’re a student and would like to get involved contact us here. Take part in a workshop with Robert Sanders at Turner Contemporary. 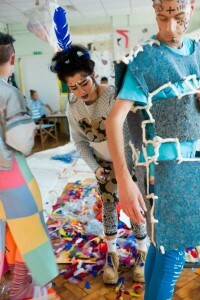 The workshop will combine elements of pattern cutting, architecture, sculpture and fashion. ‘I like to make people think about the interaction between people and what they are choosing to wear, or be worn by.’ This workshop is free and suitable for all ages but booking is required.